My daughter has always been the most artistic one in our family, which has made it difficult for me to attempt to teach her the technique that she has desperately wanted to learn. 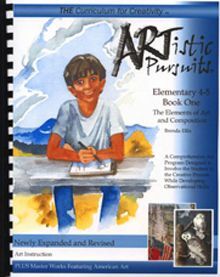 When she found out she would get to review the ARTistic Pursuits art curriculum Elementary 4-5, Book 1: The Elements of Art and Composition, she was relieved that she would finally be able to take some art lessons right here in the privacy of her own home from someone more qualified than me! I’ve heard of ARTistic Pursuits for many years. It is a highly sought after art program for homeschool families. They make in-home art instruction possible for preschoolers all the way up to high schoolers. The books offer full color lessons in a spiral-bound soft cover book. The lessons are written to the student, making it a great curriculum for families like ours where the child’s talents far exceed their parents’ abilities! My daughter is in 4th grade, so I went ahead and chose a book right at her level. Since the text is designed to teach to the student directly, I knew this would be a good choice for her. The book contains 16 units with 3 lessons and a final project (lesson 4) for each unit. For scheduling purposes, that means that you could assign this to your child twice a week, one lesson each time, and stretch the book to last the entire school year. Each lesson can be as quick or take as long as your child wants it to. Sometimes Grace wanted to do a quick drawing, and sometimes she wanted to spend a lot more time to get really detailed, so it could take over an hour for a lesson. This particular book is great for a student that is interested in sketching and drawing. There is also an element of art appreciation in the book as well. Topics covered include Elements of Art (space, line and shape, texture, value, form, contrast and more) and Composition (balance, rhythm, overlap, depth, movement, and more). The lessons are designed to help build a visual vocabulary, teach about American art and history, learn specific techniques (including how to use their materials and tools properly), and to help them apply their new knowledge to create real pieces of art. They get to use scratch-art paper, markers, and Ebony pencils on a sketch pad throughout the lessons. There is an art supply list at the beginning of the book, which you can also find at the bottom of this page. Upon finding out we would be doing this review, I immediately purchased the supply pack for the book from the ARTistic Pursuits webpage. That certainly is not a requirement, as most, if not all, of the supplies would be easily found at a local hobby or art store. I just didn’t want to drag all 5 of my kids out to find what I needed, so it was all about convenience for me! Once it arrived, I assigned 2-3 lessons per week to Grace. She never hesitated to do the lessons, because the text was brief and to the point. She would simply read the page or two of text for the lesson she was working on and look at the pictures provided. It took a few minutes to do that, and then she would get to work on the assignment. Lesson 1 for each unit had a yellow box with an OBJECTIVE listed there. I made sure to mention this and point it out to her because that was what she was supposed to be getting out of the 4 lessons in the unit. I wanted to make sure she didn’t miss the whole point! She’s so creative that she sometimes misses the bigger picture because she likes to go off in one direction and skims the bigger ideas. By reminding her to read the objective, she was forced to take time to reflect on what she was going to be learning and to ask me any questions if she didn’t understand something. Every lesson had a part with blue text on it. The blue text was there to tell the student what they will be doing as a hands-on project. This is where they would be able to see what they would be drawing and with which materials. These projects are based on the information that the student learned during that day’s lesson. I really like that the book can be used with multiple students, year after year. There are no worksheets or anything, so the text itself is perfect for large families. At under $50 for the book, it provides art education at a fraction of the cost of private instruction. The lessons are written to the student and don’t contain any fluff. The student is able to do tons of pieces of artwork, and it isn’t so structured that everyone’s work will look the same. They are encouraged to find things that they want to draw, so the lessons are much more meaningful and the artwork is more inspired and fun. I did like this program for my daughter. She loves to draw, so this was a good way for her to learn skills that I wouldn’t even know how to teach. They were laid out in a sensible order and provided enough detail that she got a great overview with practical application projects to reinforce the lessons. She enjoyed having a book to tell her different ways to draw. She’s a natural doodler, so to be explicitly told to draw focusing on a specific element was good for her. For her to need to grab an object to use that had clearly defined characteristics (such as wider than it is tall) made her really consider things in a new way, and has made her artwork much more realistic and detailed. I will consider using this with my son when he is at this grade level. He isn’t as artsy as my daughter, but the flexibility is there that he could get the information and experience from the lessons even without a passion for drawing. Overall, I enjoyed the brief lessons, and so did my daughter. They approached art in a way that introduced the elements and materials far better than I could. My art loving daughter now has a sketchpad full of great drawings to show for her time with these lessons! To see how other families liked ARTistic Pursuits at this, and other levels, click on the banner below. You can also connect with ARTistic Pursuits on Facebook.